In an effort to improve the economy after the economic crisis in 1997, Indonesia has been focusing on strengthening the non-oil and gas industry sector as well as promoting small and medium enterprises (SMEs) that have shown a high rate if seen from the number of companies and laborers. As a part of its support for this policy, JICA cooperated with the Indonesian Export Training Center (IETC) for the implementation of four kinds of training: export training, business Japanese language, inspection and quality control, and exhibition training, through the “Project Type Technical Cooperation for the Indonesian Export Training Center” (Phase 1, from 1988 to 1993). Furthermore, JICA again cooperated with IETC for the improvement of the skill in formulating and managing export training programs through the “Project on Human Resource Development in the Trade Sectors” (Phase 2, from 1997 to 2002). Through these projects, the capacity of IETC, as an implementing institution for export training, has improved. This could be seen from the positive responses from various SMEs. 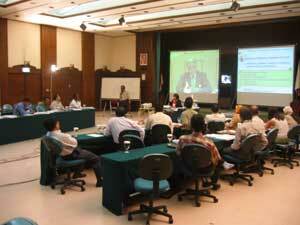 However, the number of training participants from outside Jakarta was still limited. Therefore, in accordance with the proceeding of decentralization of authorities to the regional governments, several Regional Export Training and Promotion Centers (RETPC) have been established in major cities in order to transfer the technology so far acquired by IETC to the regions.